Backyard composters are available for sale throughout the RDN. All that's needed to start backyard composting is a little space. An area of about one square metre located in a sunny well-drained location preferably located close to your garden will work. Remember to keep your composter or compost pile away from your house, other buildings, shrubs and woodpiles as this can create attractive habitats for rodents. One of the easiest ways to start composting is to buy a plastic backyard bin available in kit form at local hardware and home supply stores. Units come in a wide range of prices, are sturdy, easy to assemble and often include instructional material. If you have a big yard or acreage, a compost heap is one of the best ways to compost large volumes of yard and garden waste. The heap is created by simply piling leaves and yard and garden trimmings directly on the ground and tamping them down in layers. 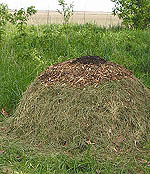 A compost heap is a good method for composting large volumes of yard and garden trimmings. Start with a layer of twigs to help ventilate the pile and alternate with layers of green materials such as grass clippings and browns such as dried leaves, straw and wood chips. Finish with some soil and another layer of greens and browns. Keep the pile about as damp as a wrung out sponge. The size of the pile and the thickness of the materials will determine how much heat is generated and how quickly materials decompose. 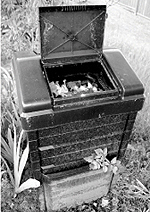 Building your own composter allows you to design a unit suited to your needs and budget. 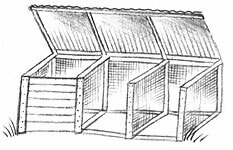 They can be constructed from wood, concrete blocks, tires, wire mesh or even a metal garbage can with holes poked through the lid and sides to allow for ventilation. Common features include a cover to control the moisture that gets in, a floor to inhibit rodents and pests, holes or vents for air circulation, and a means to remove the finished product. Download plans to build a single-bin rodent-resistant backyard composter or a three-bin rodent-resistant composting system. Plans are provided compliments of Metro Vancouver Solid Waste Services. Nitrogen-rich greens such as fresh grass clippings, plant trimmings and vegetable scraps. Carbon-rich brown materials such as dry leaves, straw, sawdust and shredded newspaper. Roughly equal amounts of green and brown materials for a steady rate of decomposition and a good nutrient value of the finished compost. The right amount of air and water keeps the biological processes working. The pile should be damp but not soggy. Turn your compost every week or two to ensure bacteria get the air they need to do their work. The higher the heat, the faster your compost will "cook". In cooler weather, the process will slow and may limit how much material you can add. Keeping your compost pile at a size of 1 square metre, ensuring the right mix of browns and greens, and regularly turning will turn up the heat. Add organic material in layers, finishing with a brown covering or handful of garden soil. Soil contains microorganisms that accelerate the process and controls odours. Keep the pile as moist as a wrung out sponge. 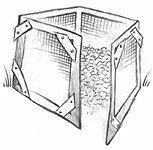 Turn the pile or poke holes to expose more material to the air and speed the composting process. If you have difficulty stirring or turning the pile, commercially available tools can help with increasing aeration. If conditions are right, the compost pile will heat up and even feel hot to the touch. As the biological processes slow down, the pile will cool as it completes its work. When the composting process is done you'll have dark, rich, soil-like humus with a good earthy smell. The finished compost should be a deep brown colour. If it appears black, the pile may have reached too high a temperature and actually been scorched. Be patient. Different materials decompose at different rates, but all will break down eventually. To speed things up, shred or chop large pieces of compostable material into smaller thumb size pieces. Prevent wet leaves and glass clipping from clumping together by allowing them to dry before adding to your compost pile. Adding small amounts of green materials at a time and mixing them with brown dry materials will help. In the fall, store a few large bags of leaves. This will ensure a ready source of carbon-rich material for your compost pile. The composting process slows during the winter months, but you can keep adding new materials. Apply your finished compost by mixing it into your soil and spreading evenly throughout your garden. Maintain your compost pile or bin to keep it from attracting bears and other wildlife. Don't add cooked foods, bread, fruit, cereal. Sprinkling your compost with garden lime aids the composting process and reduces odours that might attract bears or wildlife. Problem: The compost has a bad odour. Cause: A well functioning compost pile should not produce a strong smell. An unpleasant odour can be caused by a lack of oxygen or insufficient carbon. SOLUTION: Turn the pile to increase aeration or add carbon-rich materials such as dry leaves, straw, or shredded newspaper. Problem: The compost is damp and warm in the middle but nowhere else. Cause: The pile is likely too small. SOLUTION: Collect more material and mix the old with the new. Problem: The centre of the pile is dry. Cause: Pile lacks water, or mixing is required. SOLUTION: Turn materials from sides to centre. Add water if required. Problem: The pile is damp and sweet smelling but won't heat up. SOLUTION: Mix in nitrogen-rich material such as fresh grass clippings or vegetable scraps.